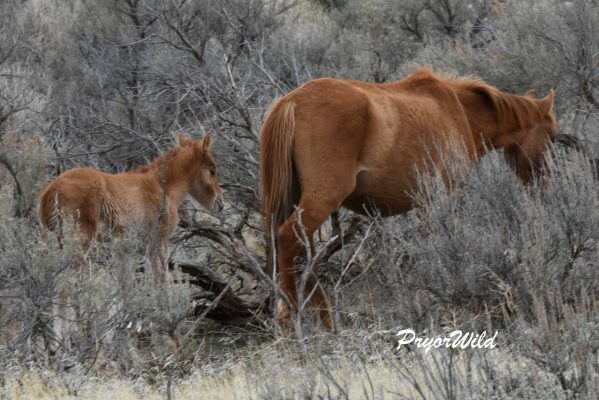 Every day on the Pryor Mountain Wild Horse Range is a good day, but there are days like Saturday, December 8, 2018 that simply surpass expectations and turn out to be perfect days. The day began for me with a phone all from Jack Sterling, a friend of ours and a friend of the wild horses. A quick plan was set up to meet asap at the Sykes Ridge entrance to the horse range. Off I went, ready for the day! The short drive in the morning cold air, set the stage for the day. The Pryor Mountains to the north were vivid against the backdrop of the blue sky and the light of the sun sending tones of gold from the rim of the Big Horn Mountains to the east. Jack climbed into the Jeep and off we went. We headed to Sykes Springs first. The spring itself was locked tight with ice. Thankfully the snow gives the horses some form of hydration. Just before turning around we spot a dun horse. My first thought was Hidalgo because of the face marking, but no…it was Parry! Parry is the three year old son of Fresia. They have been with Hawk for much of Parry’s young life. Fresia was across the road from Parry, and got nervous by our presence. She, like several other mares, have a strong flight instinct. She watched us for awhile, and then moved towards the other two. Fresia is the 2005 daughter of Durango and Buffalo Girl. Buffalo Girl was also a shy, beautiful mare like her daughter. Fresia moved toward Hawk and Parry. She is definitely a lead mare! Fresia began walking up the ridge. The other two watched and then walked off with her. This was a magic moment on the range as the horses walked through the glow of the rising sun! Part 2: Jack and I turned around and headed back towards the red buttes. These beautiful hills are from the geologic “Chugwater Formation” which is characterized by the deep red color. I call it rusty dirt because the red is formed from the oxidation of iron. These red buttes are landmarks and can be seen even from the top of the mountain. The red buttes at Lower Sykes provide good shelter for the horses and other wildlife. Not much grows in the rusty dirt, but these landmarks add a splendid beauty to the area. There is always such anticipation as you drive around to the west side of the buttes. That is where the expanse of Turkey Flats becomes visible and where horses can frequently be seen during this time of the year. We were not disappointed. As we got to the “parking lot” at the bottom, Jack simply stated, “Well look over there.” Oglala was grazing right near the road. 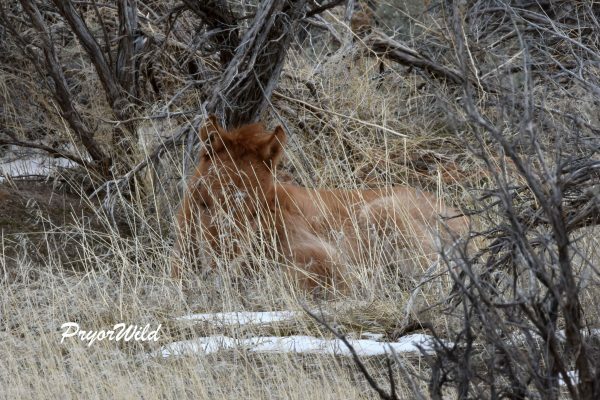 It didn’t take much time to find his buddy, Jemez resting in the early morning sun. Oglala is a solid black stallion! Just beautiful! He looks curiously at us as we get ready for our hike. He turns his attention back to the sagebrush flowers that he has been enjoying for breakfast. He sets his eyes and his ears on the sound of a vehicle in a distance. These horses are ever alert to their surroundings. 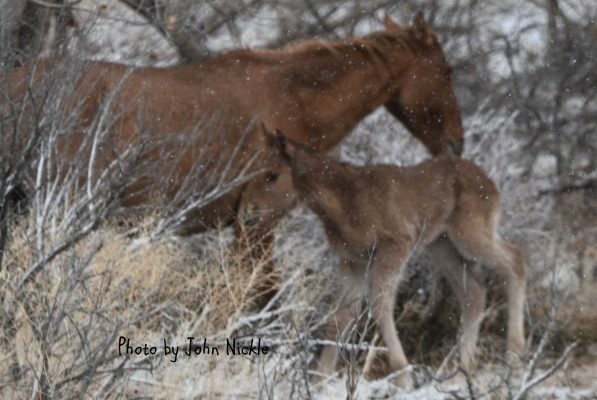 The sagebrush is a major source of nutrition during the winter months. Oglala heads off down a well-worn trail, then turns to look for his buddy, Jemez. Jemez was resting just to the north of Oglala. The big, burly stallion was not at all concerned by the two visitors to their part of the horse range. Beautiful Jemez glows in the morning light. Jemez against the backdrop of the red butte. By the time we got all our gear ready for a long hike, Jemez had started his movement to join Oglala. He looks almost small against the red butte behind him. Off we go! Part 3: The walk across Turkey Flats is about two miles. It isn’t a difficult hike if you stick to the old two-track road that cuts across the vast area. All along you get a great view of the face of Sykes Ridge and even across to Burnt Timber. Surprisingly, there was no snow which makes travel even easier. We got to the edge of Turkey Flats, at the point where it drops into the mouth of Big Coulee. It was there we spotted more horses! It was a great treat to find the Miocene clan on the edge of Turkey Flats. This has been one of the continuing sagas of 2018. And all the players were still there…..Miocene, Hailstorm/Shadow, Hataalii, and Morning Reverie. And right in the mix were stallions Lobo and Nickle. This was one of the first views of horses that we saw. From l-r: Lobo, Hailstorm/Shadow, Hataalii, and Reverie. Seeing Miocene is like seeing his sire, Blue Moon/Flint. In fact, I commented to Jack that one of the last times we were out there together, Flint and his band were right about this same spot. Off to the side was the ever persistent, Orlando. I had seen him a few weeks ago on Sykes Ridge with stallion, Inniq. But here he was back doggin’ the band. He kept a bit of a distance from the others. I think he’s been attending the school of hard knocks all summer in his relentless pursuit of these mares. At some point, that education is going to pay off for him. The band kept close proximity to one another. Jack and I took lots of photos of the tight-knit group. It is great to hike with Jack Sterling. He is friendly and has that long lanky stride that keeps a great hiking pace! The band rested in the warmth of the morning sun. All was quiet until Nickle got a little too interested in Hailstorm/Shadow. Miocene and Lobo were going to have nothing to do with this! Hailstorm kept a close eye out on the other horses in the area. She has shown good leadership skills in both Morning Star’s band and now, with Miocene. Nickle’s advances are quickly thwarted by the strong kick from Hailstorm. She walks away, but Miocene comes over to deal with the situation. No one is going to mess with his mares! Lobo then comes over to help out. The three stallions do a little posturing. Miocene does the classic “scratch in the dirt” gesture to show his strength. Then Miocene and Nickle go head to head. Finally, Orlando heads over to check things out. The sequence of photos tell the story far better than my words could! At that point, Hailstorm took the lead again and headed down into Big Coulee. One-by-one the others followed her. Hailstorm leads the way and checks out her surroundings. Morning Reverie close behind her mom. Nickle and Lobo stop for a bit of snow. Hard to believe this snow can keep these large animals hydrated through the winter months. Jack and I took this as our cue to head to the next bunch of horses. Part 4: The next two horses were not far from Miocene’s bunch and it didn’t take long to figure out their identity: Mica/MatoSka and Gaelic Princess. Mica is just stunning with his darker than normal winter coat. He has matured so much and seems to have settled down in the company of this mare. Gaelic Princess lives up to her name with her regal demeanor. She is simply stunning. Mica/MatoSka and Gaelic Princess take a glance at us, then return to their business. Gaelic kept a close watch on the other horses in the area. I was curious to see if she would be tempted to try to join her former mare companions, Hailstorm and Hataalii, after their many years together in Morning Star’s band. But she was more interested in the horses to the south of them. Gaelic and Mica keep a close watch to the south. The two horses started moving against the beautiful backdrop of the landscape. Gaelic Princess took the lead and she was followed by her handsome stallion! Gaelic Princess looks just lovely against the colorful backdrop of the area. This looks out in the direction of Burnt Timber Ridge Road. Mica is the 2012 son of Cloud and Feldspar. He entered the bachelor world in May 2014 after the battle between his sire and Doc. We took the same opportunity to head south just a short distance to the next band. 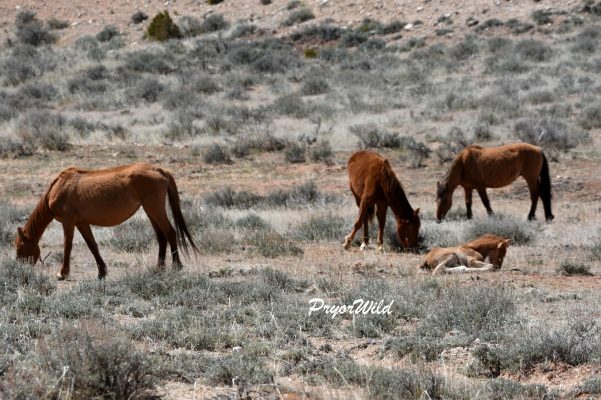 How exciting to find Hamlet and his band of three mares: Sapo, Maia, and Niyaha. This was my first glimpse of Niyaha with this band. Dennis McCollough had reported the change a couple weeks ago in one of his wonderful FaceBook posts. Now we were seeing it firsthand! Maia and Niyaha were together with the stallion, Jupiter, up until last year when Niyaha ended up with Inniq. She remained hidden on Sykes Ridge through the summer. Not long ago, Inniq was seen without the mare. Her whereabouts were unknown until she was discovered with Hamlet. Hamlet looks amazing! This might be the best I’ve ever seen him. The mares were skittish and stuck pretty close to each other. The stately mare, Sapo, stands between the two dun roan look-alikes, Maia and Niyaha. The band was nervous and started moving away. We left them as they sure don’t need additional stress at this time of the year. Jack and I turned back to the north to check out the one remaining band in the area. The size and color composition of the band made them very easy to identify. What a thrill to see Irial’s beautiful band! Our arrival was well noticed! I did a quick head count and found all members present and accounted for..nine in all, still missing Pilar from this group. Dove was the sentinel. 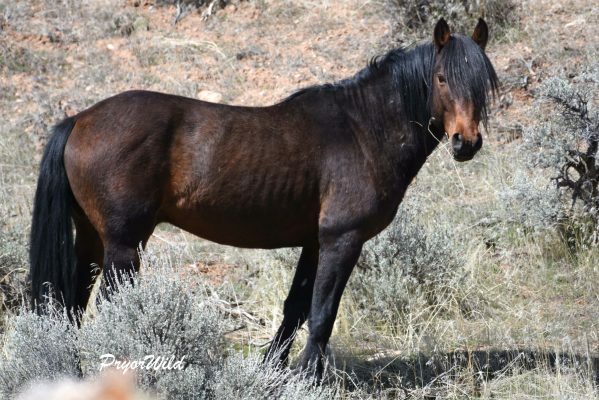 She is a great identifying horse in the band with her wide blaze and very distinctive dark buckskin color. She is a shy, beautiful mare who did not take her eyes off of us. Dove peered up at us through the sagebrush. She is such an elegant beauty! Right up front with Phoenix was Adona. She is one of the “blues” in this band. Luckily she has a star which makes her more identifiable. Adona is the 2000 daughter of Shaman and Sitka. Irial’s band is one of mares and daughters. This, I believe, is one reason that he has been able to maintain such a large band. Fool’s Gold and Pele are examples of the mother/daughter pairs. At the age of three, Pele is still nursing. She had and lost a 2018 foal that was named Sparrow. Fool’s Gold and Pele look stunning together in the winter with both coats bright shades of dun. Pele loses her roan appearance in the winter. She and her mom, Fool’s Gold look so beautiful together! Another of Irial’s mother/daughter pairs is made up of Blue Sioux and LaBrava. Blue Sioux is an absolute legend. At the age of 25, she is finally showing some age…but still a blue roan beauty! La Brava, daughter of Blue Sioux and Coronado/Red Raven is a spectacular bay roan mare. Her story of 2018 still causes ache in my heart with the loss of her foal, Santiago. In addition, Pilar moved onto Chief Joseph’s band. Thankfully she still has her mother and other mares to provide companionship. Lovely Manuelita/Mourning Dove shares her color with her mother, Dove. Manuelita was quite the “poser” today and gave us lots of good photo ops! Manuelita/Mourning Dove and her mother, Dove, share the same unique shade of dark buckskin. Manuelita displays the roan gene of her sire, Coronado, which is faintly visible on her winter coat. Scarlett/Velvet gave us quite a surprise….she looks amazing and certainly does not look to be 23 years old! Scarlett/Velvet is the 1995 daughter of Konik and Feather. Last but not least is Irial himself! This handsome stallion stood at the north end of the rest of the band. He was not particularly interested in us, but kept a good watch on his band. Like his full sister, Gaelic Princess, Irial is a wonderful representation of both Prince and Ireland. Irial took one quick look up at us! Irial turned 10 in 2018. He has maintained a large band for several years, despite a relatively young age. Then he turned to look at his band. Our day didn’t end here. We continued on up into Big Coulee. This is a land that Jack knows well, but if fairly new for me. We only saw one horse up in the Coulee as we met Oro coming and going. The rest of the trip was filled with magnificent beauty and points of historical interest. The BLM-Billings Field Office has issued a preliminary EA which is proposing a 2018 gather and a modified fertility control plan. Since the release of the plan, we have been very busy gaining understanding of the plan, reviewing and updating our large data base of historic horse records, and writing comments about the proposal. This plan is complex as it combines the two management methods of a gather/removal and fertility control. We have provided a link at the bottom of this post to access the proposal and submit comments. A brief summary of the plan is provided as well as some of the main points we will address in our comments. The proposed action calls for the removal of 15-20 horses aged 1-4. It also proposes modifications of the fertility control with young mares ages 2 & 3 treated with ZonaStat-H. Mares 4 and above would not receive treatment until after they have successfully foaled twice. The gather process would consist of bait and/or water trapping. It would not utilize helicopters in the gather process. Decisions about the horses for removal would consist of a tiered system based on the number of offspring a mare has had. The target group of 1-4 was determined as young horses are more likely to adjust to a domestic setting and are more desirable by adopters. The rationale for the removal is due to deteriorating range conditions. 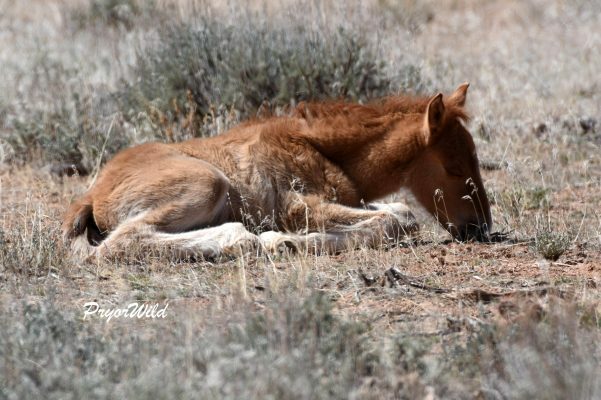 The adequate management level (AML) of the Pryor Horses is 90-120 (excluding the current year’s foals). 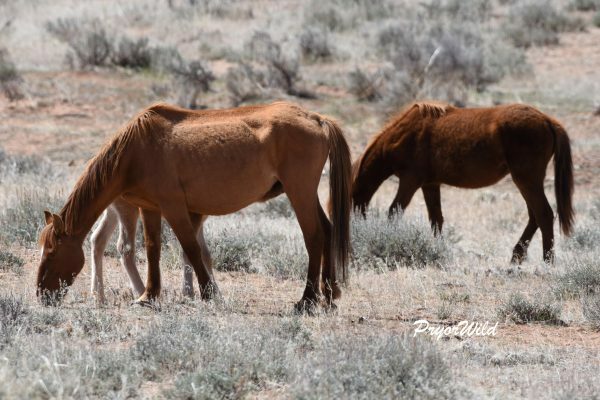 The proposed action calls for removals if the number of wild horses exceeds 5% of AML. Population: We recommend using current counts of wild horses (at the present time this is about 155 horses). In addition, we have had a low foal birth rate for the past two years and a high death rate. This overall growth rate should be strongly considered when planning any removals. 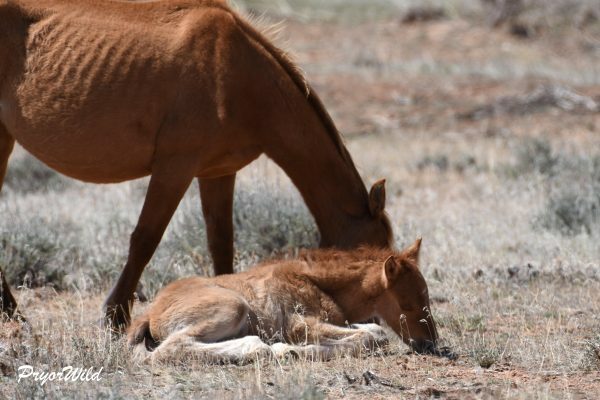 Range Conditions: To address range deterioration, we recommend seeking out range management solutions rather than relying only on horse management solutions. The Herd Management Area Plan (HMAP) does offer range management including re-seeding and control of invasive species of plants. 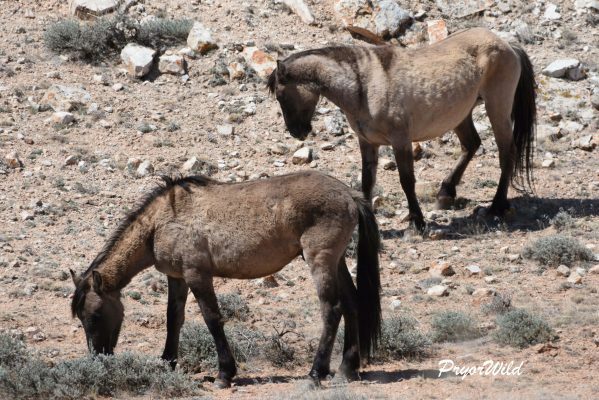 It isn’t easy to rehabilitate the fragile ecosystems of the Pryor Mountains, but we do encourage the BLM to seek out and implement possible solutions for improving the range conditions not just for the horses, but for the other wildlife in the area. 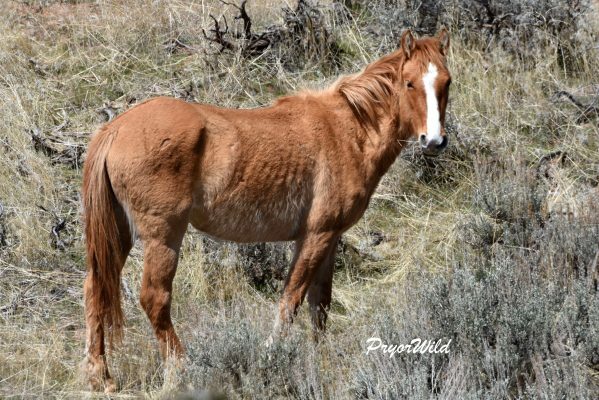 Fertility Control: For many years, the Pryor mares have been treated with PZP. The last two years have shown the results of the management action with low foal crops. The proposed EA has modified the fertility control plan which we believe is beneficial to the herd. For one thing, the younger mares will receive treatment as 2 and 3 year olds, but not as 4 year olds. In addition, the age cap of 9 was removed. This meant that any horse who turned 10 went on treatments regardless of offspring. Now the mares will be left untreated until they have successfully foaled twice. 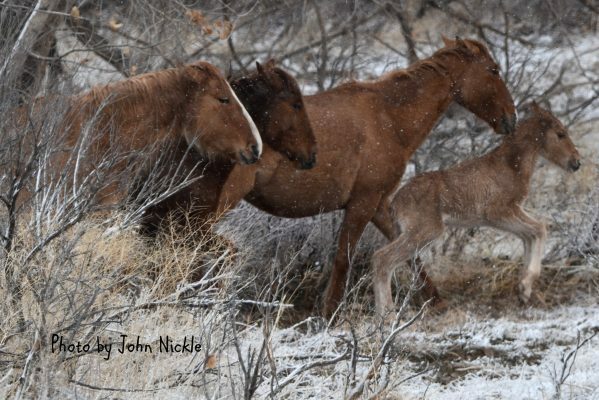 We are supporting this change with the recommendation to better clarify the two-foal change. 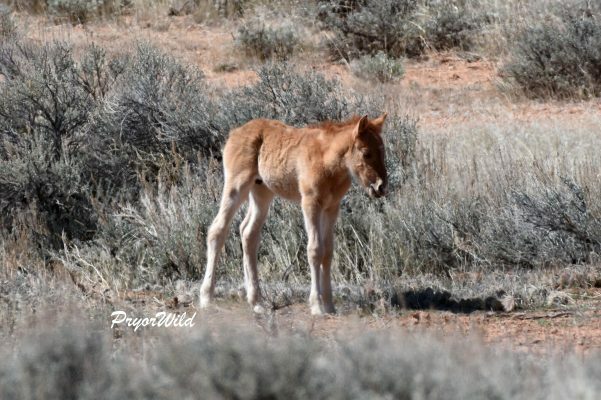 Genetic Preservation: The Pryor horses are a small group with a limited gene pool. It is essential to make management decisions that would have the least impact on the gene pool. We support the proposal in this EA to collect genetic samples, but not just of the removed horses, but from as many horses as possible. The HMAP recommends ensuring that each mare has the opportunity to contribute genetically. We also believe that the stallion genetic contribution is essential. The Mustang Center maintains a chart of horse lineages that date back to the 1970’s. With this list it can easily be seen how many lines have gone extinct due to natural mortality and removals. The genetics of the herd do depend on having an adequate herd population with representation from as many horses as possible. Removal Decisions: We would support the proposed action with modification to the proposed Tier Approach. A systematic process can be developed that includes management objectives as defined in the HMAP and included in this proposed EA. This system would evaluate the horses in the target group (ages 1-4) based on those objectives. The number of horses to be removed would be determined by this decision process, not by a pre-set number of horses. We are recommending a very cautious gather this year due to factors listed above of current herd demographics and the need to protect from genetic loss. 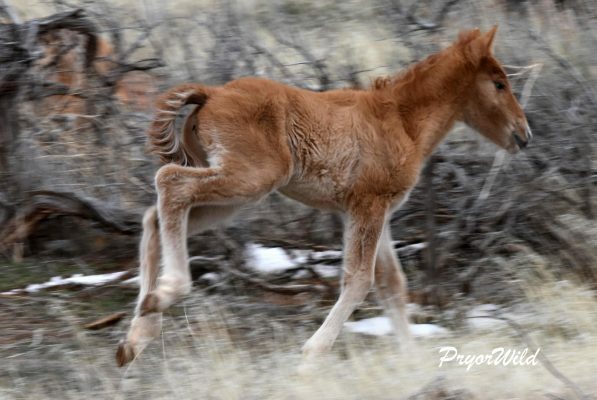 The Pryor Horses are a wonderful American treasure. 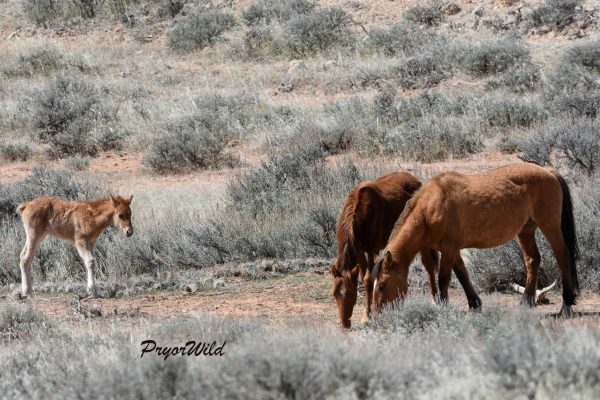 50 years ago, a group of local citizens led a national movement to preserve the small herd of wild horses which led to the Pryor Mountain Wild Horse Range as the first public wild horse area in the United States. The quest for their preservation continues today. 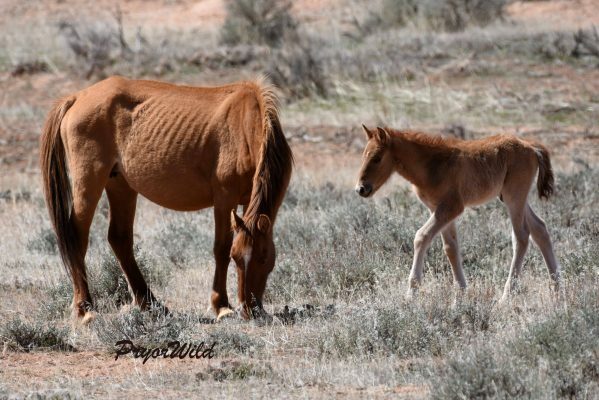 We do encourage people to submit comments in support of the Pryor Horses. 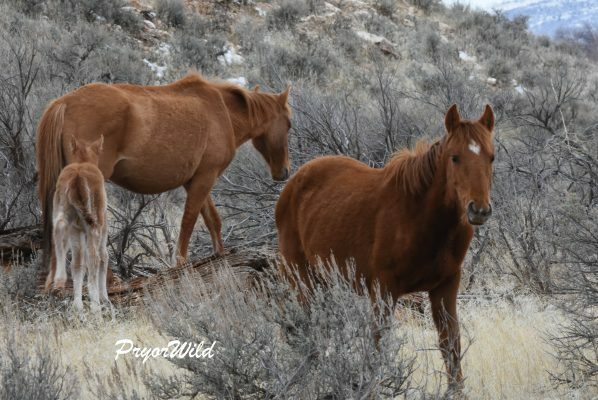 Please use our comment ideas to provide background information, but put them in the context of your experiences/knowledge about wild horses and your interest in them. Make efforts to keep your comments positive and constructive. Link to the preliminary EA: Comments are due to the BLM by February 16, 2018.